What can you tease about the premise of The House On Cold Hill? The House On Cold Hill was very much inspired by what happened to myself and my former wife in 1988. It’s about a couple: Ollie [Joe McFadden] – who made a very successful business in internet web design and he’s sold it, which is what gives him the money to buy the house – and his wife Caro [Rita Simons], who is a lawyer. They’ve been townies all their lives and they decide to follow the dream so they buy this big old wreck in the country, moving to it with the idea that it’s going to be their forever home and they’re going to spend the next ten years restoring it. Then they find out that they may not the only people living in it! What’s in store for audiences when they come see the show? It’s a very modern ghost story that brings in Facebook and Alexa. We’ve tried to become really modern with the whole idea that ghosts aren’t necessarily stuck in Victorian Gothic times so the ghosts in the play can use computers, as they did in the book. Audiences are in for lots of shocks and twists and turns and above all else The House On Cold Hill is a thriller so I hope they’ll be getting some nice scares along the way along with those twists and turns in the story. How hands-on are you when it comes to stage adaptations of your work? What I love about working with [producer] Joshua Andrews and [writer] Shaun McKenna is how we all respect each other’s views and opinions. I’m very hands-on but I know my limitations. I’m an author and I write novels. It’s a very different process making something work on the stage and for me Shaun is a magician. I’m astonished at his vision because transposing a book into a play is really tough. You have to cut down on the characters enormously. I’ll have maybe 20 or 30 characters in a novel but it’s not economical to have more than between five and nine characters in a touring stage play. Shaun has to condense those and also the locations because The House On Cold Hill novel moves around between a graveyard, a vicarage, a school, Brighton and Sussex, whereas with the play we’re confined to the interior of a house. How would you describe the collaboration between yourself, Joshua Andrews and director Ian Talbot? It’s brilliant. I’ve known Josh for quite a long time. We worked together briefly in the film business before we got together on the plays. Ian is just a fantastic director and I can’t imagine a happier team. I don’t think we’ve ever had an argument between us. If I don’t like something then everybody discusses it, likewise if Josh or Ian don’t like something. This is our fourth collaboration and so far they’ve all been very happy and very successful ones. What do Joe McFadden and Rita Simons bring to the lead roles? What’s really important with any cast, as with characters on the pages of a book, is that the audiences in the theatre and the readers of the book like them and connect with them – even with the bad people because the best villains are those we care about. Joe and Rita both have a great warmth about them. Instantly audiences will go ‘I like these people’ and then they’ll be going ‘Oh no, they’re in terrible danger’. It’s the same with Ollie and Caro’s daughter Jade [Persephone Swales-Dawson], who is this sweet kid. The more you care about somebody the more you fear for them. What draws you to the thriller genre? I’ve always loved thrillers because I think it should be about writing page-turning books. If you go back to the roots of storytelling, Shakespeare’s plays were page-turners with people eager to know what happened next. Charles Dickens is another example of a great writer who wrote real page-turners. I think as a storyteller it’s important to not bore your readers. At the same time I like to get messages across through my books but if I pick up a novel and a chapter is 53 pages long I think ‘Sod that!’ but if the first chapter is two and a half pages long I’m intrigued because there’s a cliffhanger at the end of the chapter and you’re compelled to read the next one. Was branching out into theatre always part of your plan? I’d dreamed from the age of eight or nine of having a play on stage because I always loved live theatre. My parents had regular theatre tickets at Brighton and I’d go along to plays with them, but I never thought it would happen. I did have a go at writing a play some years ago that almost got put on but I then got sidetracked with filmmaking and my novels. As I say, I’d known Josh and worked with him briefly, then I met him again at a party about seven years ago and he asked ‘Do you have any books you think might work on stage?’ That was the start of this wonderful collaboration. What have you most enjoyed about getting involved in the theatrical process? [Laughs] It gets me out of my cave. There’s also the fact that storytelling is an oral tradition. Before books there were travelling storytellers and great writers like Shakespeare wrote plays because it was before books existed, apart from for a tiny minority who could afford them and who could read. 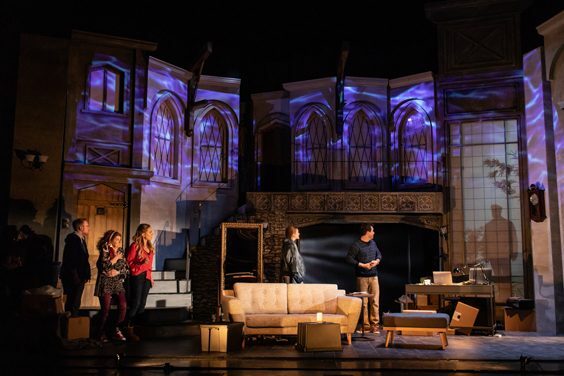 So in a way theatre goes right back to the roots of storytelling, with that instant connection with the audience. What I also love is kind of the danger of a stay play. Once a book is finished it stays the same but with a play every single production and indeed every single performance is different, especially if something goes wrong or audiences react differently. I love sitting at the back of the theatre watching the audience and seeing what they react to, and I’ve learned a lot from that. You can’t sit and watch somebody read your book or [laughs] it would be a bit weird if you did. What feedback have you gotten from fans about the stage productions? The feedback I get a lot is that they love the fact the plays are both faithful to the spirit of the books and yet different enough that if you’ve read the book in question you’ll get a new experience out of the play. We’ve changed the endings, including this one, so you see them nodding as if they know what’s going to happen, then you get the gasps of surprise. It’s also fair to say that a decent percentage of our audiences have not necessarily read my books and just love that fact the plays are new and entertaining modern day thrillers that keep you on the edge of your seat. Why do you think theatre audiences are drawn to spine-tinglers? There’s a kind of comfort in it because you’ve got the shared thrill and you’re surrounded by hundreds of others so everybody jumps at the same time, then everyone laughs. If you were sitting at home watching a scary movie, with creaking noises and the rain pelting down outside, it’s not quite the same comforting experience. I think the world is a scary place and part of the reason people love reading a good thriller or going to a thriller play is because they can be scared but in a controlled environment. You walk out into the daylight or the nice evening air and everything is a bit better and happier. Is there a particular thrill for you in scaring people? Do you scare easily yourself as an adult? Real life scares me much more than anything. There’s a great quote from Oscar Wilde that goes ‘I can tolerate brute force but not brute reason’. There’s so much brute reason in the world and that scares me. As a writer I know when I’m being manipulated by thrillers, but the original Cape Fear really frightened me, as did Psycho and The Silence Of The Lambs. That was a very creepy, powerful film, as was The Texas Chainsaw Massacre. I used to make horror films so I know how to pull the strings but I still get scared as hell sometimes. 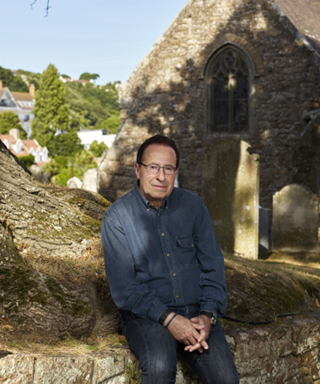 One Comment on "An Interview with Author, Peter James"
Your Peter James interview was so interesting and excellent. Have saved it on my iPhone. Thank you so much. Deryck, down here in Norwich.